Size: 42 x 21 x 66 (LXBX H) in inches approx. Handmade by skilled artisans in Traditional Design with premium finishing. Two Drawer for pooja essentials. 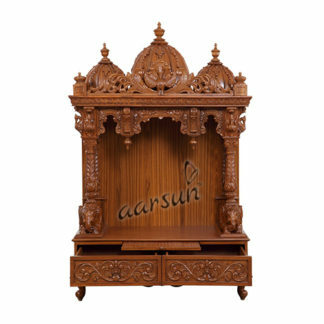 Product Details : Teak Wood Product Size: 42″ (Length) X 21″ (Width) X 66″ (Height) Beautiful domes at the top with carving at the mehraab.